Here's another set of Broome Duster programs, this time from the 1978-79 season. All the programs I have from this year look the same, so I'll only post one picture. Before I say anything about the 1978-79 season, take a look at that program cover. That is the gaudiest goalie mask I have seen, almost psychedelic! Wonder if anyone wore that in a game? It was definitely an eye-catcher when I bought it a couple years ago. 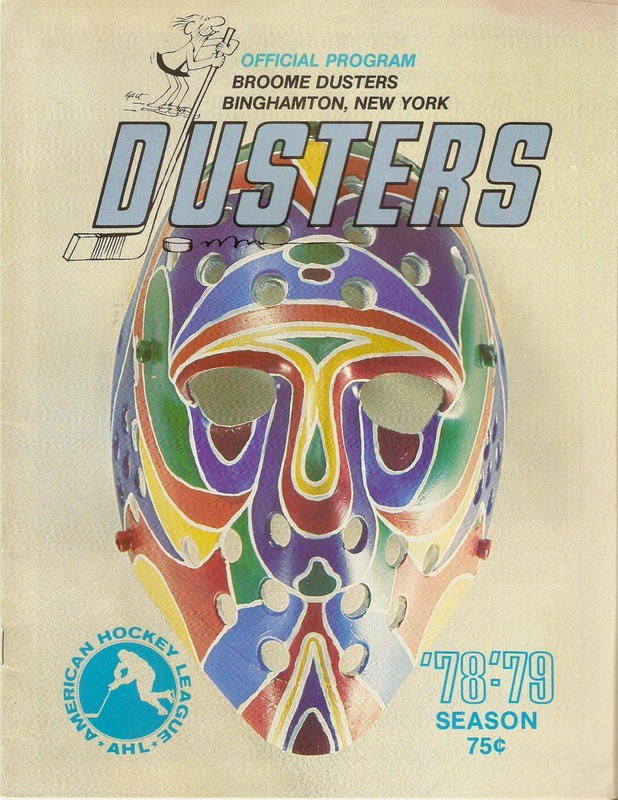 In 1978-79, the Dusters improved somewhat on their first AHL season. The team went 32-42-5, third place in the Southern Division. Their 69 points were 32 points behind first-place Nova Scotia, that night's opponent, and just five points ahead of fourth place Rochester. Joe Hardy replaced Larry Kish as head coach, and Andre Veillieux was the new President-GM. The team was an affiliate of the Pittsburgh Penguins. The offense improved somewhat, scoring an even 300 goals, sixth in the league. Randy MacGregor was tops in points with 75, while Richard Grenier again led the team in goals with 37. Six Dusters scored over 20 goals that season. On defense, the team again struggled, allowing 320 goals, fourth-worst in the league. Six different goaltenders were used that season, and Ken Holland played the majority of games. In 41 games, Holland went 19-17-3 with a 3.91 GAA. His main backup was Louis Levasseur, who went 10-12-2 in 25 starts with a 3.77 GAA. The Dusters qualified for the Calder Cup Playoffs for the first time in 1978-79. They faced Hershey in Round One, and knocked off the Bears in four games (best of five). In the semifinals, Binghamton faced New Haven, and fell in six games. Attendance dipped in Year Two, as the Dusters drew 3,935 per game, fifth-best in the league.